At the height of the Diwali air war - almost every airline had dropped one way fares to a light Rs. 899. One airlines' site crashed minutes after the offer went live, and when it came back, seats were gone! I did most of my searching on a third-party ticketing website, and won a one way ticket for Rs. 899 (turned to over a thousand adding the website's processing fee as well). One website had an interesting offer for round-trip bookings using their app. I decided to play around with the app a bit, and search tickets for a trip that I was just contemplating. The app threw me a round trip ticket for Rs. 1798 - I played around a bit more, added a coupon code and the final fare (for the round trip) dropped to a jawdropping Rs. 1332! 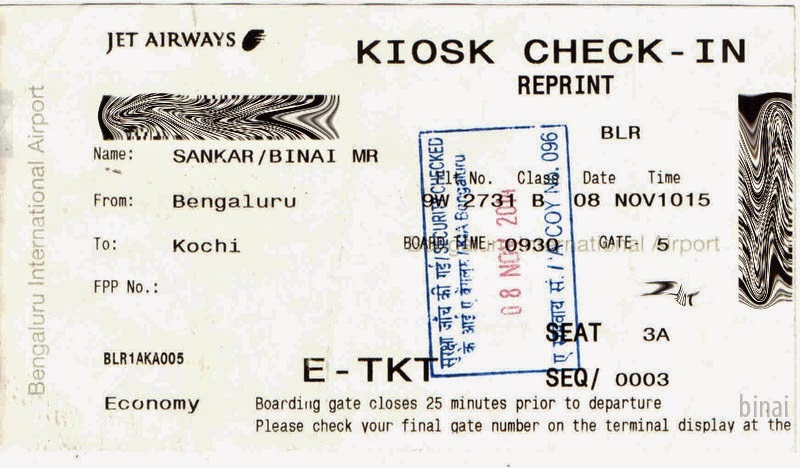 It took me some time to understand that I wasn't dreaming - in a couple of minutes I had a round-trip PNR generated on Jet Airways, for a service operated by Jet Konnect at a fare I've only heard in the Air Deccan days! As the day of my journey closed in, I got sicker and sicker. On the day before my trip, I had a bad viral fever and a painful Pharyngitis - ended up spending almost 12 hours on the bed alternating between a state of consciousness and lack of it. Despite the fever, I remembered to check in online and opted for an mBoarding pass. I woke up at an unearthly 2AM - still running fever and a bad body pain. I slept for some more time and finally got off the bed at around 0545hrs. I was still not in the best of my senses and did not really understand what to do. Finally, I decided to carry on with the trip sometime around 0630hrs. I had very little time left to get ready - the fever (rather, the hangover of it) slowed me down as I went about getting ready. I was dropped at the bus stop around 0745hrs by my brother - I had just around 2 hours left for the boarding time now. I got into the first bus that came at the stop, which dropped me at Shantinagar around 0805hrs. I hoped an Airport bus come by quickly - the timetable board claimed the next bus was only at 0840hrs. I had a few jitters and looked towards the entrance of the platform with a very hopeful face - wait! Did I see a green bus? Yes, I did! A bus to the Airport rolled in, and I took a seat - at the back. The driver was quite slow at the beginning, giving me some missed heartbeats - but picked up later and I was dropped at the airport around 0915hrs. I headed straight to the terminal - the security guard at the entrance cross verified my bookings and ticked across the details and let me in. The check-in counters were all busy and resembled a peak-day railway reservation counter. I headed straight to the self check-in kiosk to print out my boarding pass, and headed to security check. It just as I entered the queue I remembered that I hadn't taken a baggage tag - BIAL had kept plenty of them along the queue for security. I left the bag for scanning and joined a queue for frisking. I got into the security hold by around 0930hrs. Boarding for my flight was from Gate #5, which is on the lower gate. While I reached the gate, they hadn't opened boarding for my flight yet. Boarding commenced at 0940hrs - we were being bus'd to the aircraft (quite expected). The boarding queue was fairly long, and I was among the last passengers to board. Two buses were used to ferry the passengers - I was in the second. There was a fairly long queue at the aircraft too - I was among the last, again. VT-JCP, an ATR 72-500 delivered to Jet Airways way back in 2008 was flying 9W-2731 to Kochi this day. As a safety precaution, only one passenger is allowed on the boarding ladder at a time - in order to ensure that, they held on to boarding passes till the earlier passenger was inside. Purser Shruti was at the door verifying each boarding pass and welcoming the passengers with a warm smile. The second flight attendant, Bhawna was inside helping out passengers with luggage. My seat was #3A, and it took me sometime to reach my seat since passengers who boarded earlier were still to settle down. My co-passenger was already at the seat. I got to my seat by around 0954hrs - it was quite stuffy inside, and the sun was on my window. Boarding finished soon after I sat, and the aircraft was pushed back at 1003hrs - a good 12 minutes before our scheduled time. Captain Jasmine and First office Sarfaraz were in command. Safety demo started soon after push back. We started taxiing towards Rwy27 at around 1006hrs. 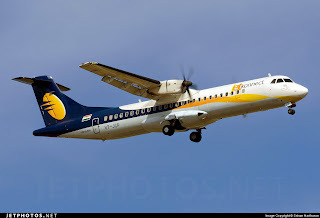 We were were held for sometime, as a SpiceJet Dash Q400 landed followed by Air Costa's Embraer 190 (VT-LVR). We finally took off at 1013hrs. The ascend was quite steep and we reached cruising altitude soon enough. Soon after that, the seatbelt sign was switched off, and the buy-on-board service started. Since the sun was on my side, and it was quite cloudy outside, I had nothing to see outside, and the glare from the clouds made me keep the shades closed for a while. I did not feel like buying anything on board - thanks to the fever (I was again having elevated temperatures) and gastric upset due to the antibiotic I had taken that morning. All I took was a glass of water. The flight was largely eventless - except that we had cloud cover all through the flight, except for a few minutes after take off, and a few minutes before landing. I spent most of the time reading JetWings - the in-flight magazine of Jet Airways. Landing was announced at 1102hrs, and the seat belt sign came on. By now we slowly cleared the cloud cover, and land below was getting visible. The lush green surroundings confirmed that we were about to land soon - and we touched down on Rwy27 at 1118hrs. We took the rapid exit taxiway, and headed to Stand 8, and finally parked at 1121hrs. Soon after we stopped, two buses rushed towards the aircraft. Since I was at the front, it took me some time to get off the aircraft - I got into the second bus, which ferried me to the arrivals terminal. This was an old BS-1 Leyland bus with fancy looking seats and a very hot sultry interiors (the AC wasn't switched on) - I was out of the airport at 1133hrs. The scheduled arrival time was 1135hrs! I took a bus from there, and two other buses later to reach home a couple of minutes past 1300hrs. I always wanted to have a day-time flight in the ATR - and this one fulfilled that desire. The ATRs, like all the turboprops, is a noisy equipment. Many Indian's have this aversion to aircrafts with a fan - and that has a reason for sure. But I believe these aircrafts are perfect for short haul routes like BLR-COK - helps the airline save some operating cost and perhaps helps in providing better frequencies as well.